Trenton, N.J. -- On November 30, the Student Activities Board at the Trenton Campus hosted its Second Annual "Showtime at Kerney" Talent Show. Close to 100 people packed the Center City Cafe to enjoy the show. 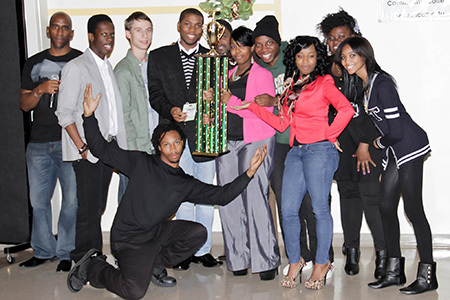 According to Trenton Campus academic counselor Terrence Carter, who is the advisor to the Kerney Campus's Student Activities Board (SAB), the show consisted of 17 acts with performers competing in cagetories including Best Male Vocalist, Best Female Vocalist, Best Poet (Spoken Word) and Best Hip-Hop/MC. The first place winners from each category competed in the championship round for the grand trophy and the $100 prize. The overall winner of the competition was Tashanna Ellis, who placed first in the Female Vocalist category. Ellis, a 2010 MCCC graduate, won with a song she wrote and performed entitled "Trenton." The talented singer.songwriter runs a mentoring group for teenage girls called "Emija's Hope." 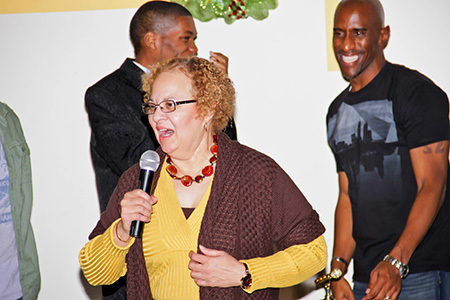 MCCC Executive Dean Diane L. Campbell shared her congratulations with the talented contestants. Also in attendance was Anderson Monken, Mercer’s Student Government Association president. Carter stated, “This event really gave our students a chance to shine. I thank everyone who came out and supported them. The event was awesome." Pictured are contestants at "Showtime at Kerney." The winner was vocalist and songwriter Tashanna Ellis, center. Also pictured is SAB advisor Terrence Carter, far left, and SGA President Anderson Monken, third from left. Executive Dean Diane Campbell congratulates all contestants and thanks those who came out.